If you’re feeling bummed about having to head back to school (yes, it’s almost that time already! 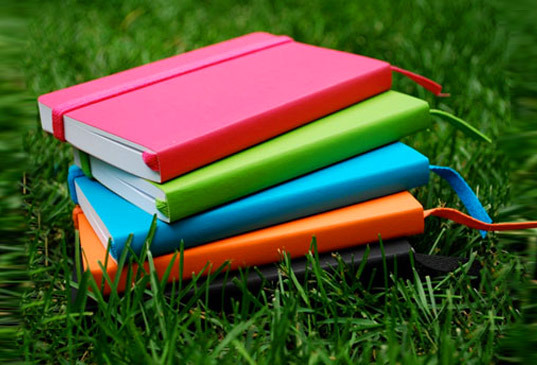 ), cheer yourself up with these vibrant and stylish notebooks, planners and journals from ecosystem. Made from 100% post-consumer recycled paper, they’re clearly a smarter choice than notebooks that are made from new paper – in fact, ecosystem has already saved (as of 2009) 3,046 full-grown trees, 1,299,751 gallons of water and 283,974 pounds of greenhouse gases! Each book has its own unique ID number that can be used to track its origins and even to find out how to recycle it once you’re done. If you're feeling bummed about having to head back to school (yes, it's almost that time already! ), cheer yourself up with these vibrant and stylish notebooks, planners and journals from ecosystem. Made from 100% post-consumer recycled paper, they're clearly a smarter choice than notebooks that are made from new paper - in fact, ecosystem has already saved (as of 2009) 3,046 full-grown trees, 1,299,751 gallons of water and 283,974 pounds of greenhouse gases! Each book has its own unique ID number that can be used to track its origins and even to find out how to recycle it once you're done.